Halifax back rower Dane Manning will be available for Saturday night’s Summer Bash fixture against Bradford Bulls at Blackpool (7.0) after escaping suspension at Tuesday night’s RFL disciplinary committee. 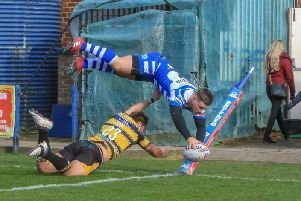 Manning and teammates Steve Tyrer and Andy Bracek had all been charged after the brawl that erupted in the closing stages of Fax’s 22-14 loss at Leigh nine days ago. Tyrer and Bracek entered early guilty pleas, accepting two and one game bans respectively, an option not open to Manning after the 10-game ban he was handed last year after an incident in the same fixture. But while Manning was found guilty of striking by the committee, and fined £100, he left without a suspension, boosting coach Richard Marshall’s resources against the Bulls. Leigh’s Kurt Haggerty and Tom Armstrong were banned for two and one games respectively.